Gold Reef City is “where old Johannesburg meets Disney,” said my guide book, branding it “a large, gaudy, tacky entertainment complex”. True, the first thing visitors encounter as they draw near is the big ferris wheel or the screams of passengers being entertained on one of the thrill rides, but dig a little deeper and there’s some history fascinating to be discovered. The park, on the edge of South Africa’s commercial capital, is built around an old mine (Number 14 shaft of the Crown Mines to be precise) which opened in 1909, just two decades after gold was first discovered, giving birth to the Johannesburg we know today. I managed to get a cheap ticket whereby I was escorted through the theme park by a security guard who made sure I didn’t go on any of the rides and taken straight to the mine tour. Donning a hard hat and carrying a torch, a guide accompanied our small group into a small cage lift so we could reach one of the old shafts (mining operations ceased in the 1970s when the gold ran out) 200 metres below the surface. People flocked from all over world to work in South Africa’s mines at the height of the gold rush – with some coming from as far afield as Cornwall and China. On the tour, I got a sense of the tough working conditions miners faced. They endured an eight hour day of hard labour, but such was the extent of the mining operations that on top of that they could need to spend an additional hour and a half getting to their spot. 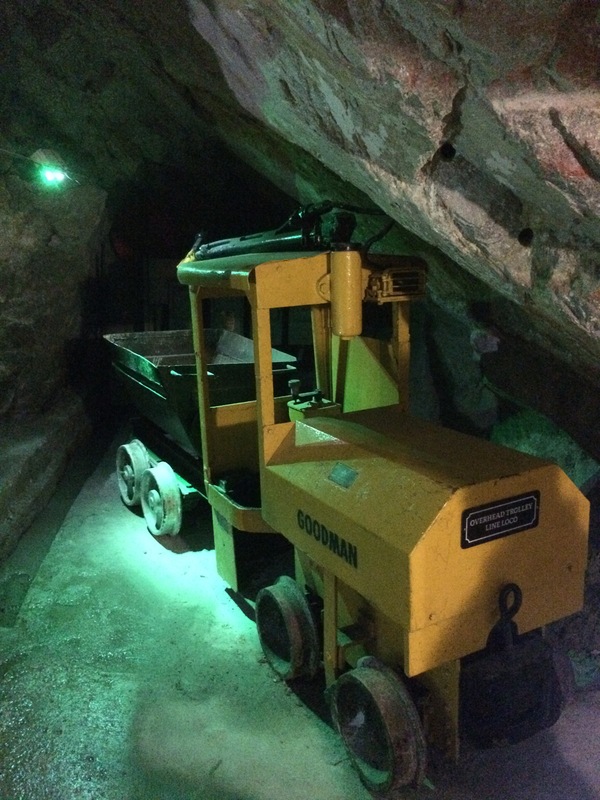 They needed to mine in some extremely cramped spaces, where there were often rock slides and miners had no protection for their ears – the noise was particularly intense once electric drills were introduced and many went deaf at an early age. After the tour, I had a look around the streets that Gold Reef City had recreated depicting old Johannesburg. 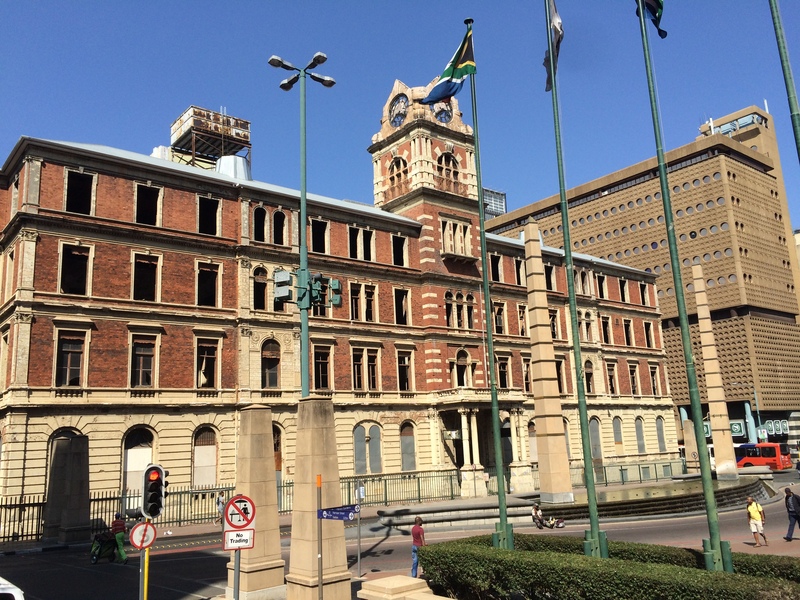 There was a plaque on one – used as a theme park hotel – saying it was based on the design of De Nationale Bank Der Zuid-Afrikaansche Republiek Beperkt which was erected on the corner of Market and Simmonds Street in Johannesburg in 1892. Yet by the time I got to the ‘town square’, the authenticity was losing the argument – this spot was dominated by a stage where musicians were doing sound checks and a big screen showing the Rugby World Cup. Parked in the shadow of rides that whizz paying guests at great speed, there is however a fascinating relic. Known as a bullion coach, it is one of the last remaining examples of its kind and was used to carry gold between Johannesburg, Durban and Cape Town between 1911 and 1967. Heavily fortified, visitors can step inside and see its sleeping-quarters, kitchen and bathrooms – as well as the large safes where the gold was kept. The real old Johannesburg – generally referred to today as the Central Business District – has changed immensely since it was founded in 1886 and in 10 years had a population of 100,000. On paper the city was built in an impractical location given its poor water supply, considerable distance from the coast and high altitude, but that logic didn’t account for the fact that large amounts of gold was found in the area by Australian prospector George Harrison. Soon after the discovery, what had been a quiet area of the Transvaal became swamped with diggers and a tented city sprung up. Wood and iron buildings were introduced in the 1890s and more substantial brick buildings were erected in the early 1900s. 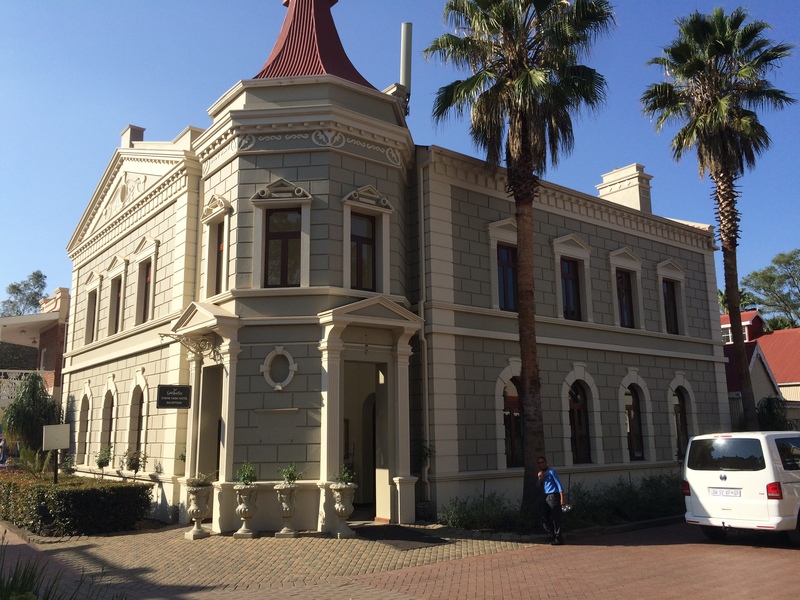 The first mining camp in the city – named by its surveyor either after himself, Christianan Johannes Joubert, chief of mining or the president of the South African Republic, Paul Johannes Kruger – was built on what is now Commissioner Street, and in the years that followed impressive commercial and financial structures sprung up in the neighbouring streets. Many big businesses and institutions – including the Johannesburg Stock Exchange in 1999 – left the CBD in the 1980s and 1990s for new premises in plush suburbs like Sandton and Rosebank on account of soaring crime levels. Some big banks and the mining companies did stay however and there is a big programme underway to bring other organisations back. Sadly many of the original 19th century and early 20th century buildings have disappeared, but there are some traces, including Johannesburg’s first post office, a neo-baroque structure dating from 1897 and once the tallest structure in the city (unfortunately it currently stands as a burned-out shell, yet promises have been made to restore it). And the Rand Club is where, since 1887 (although the current building dates from 1904), mining magnates have come to socialise. The hall has a stained-glass roof and its bar is reputedly the longest in Africa. While wealthy whites lived in plush housing to the north of Johannesburg (as is the case today), most people lived in boarding houses in working-class shantytowns closer to the mines in the south. 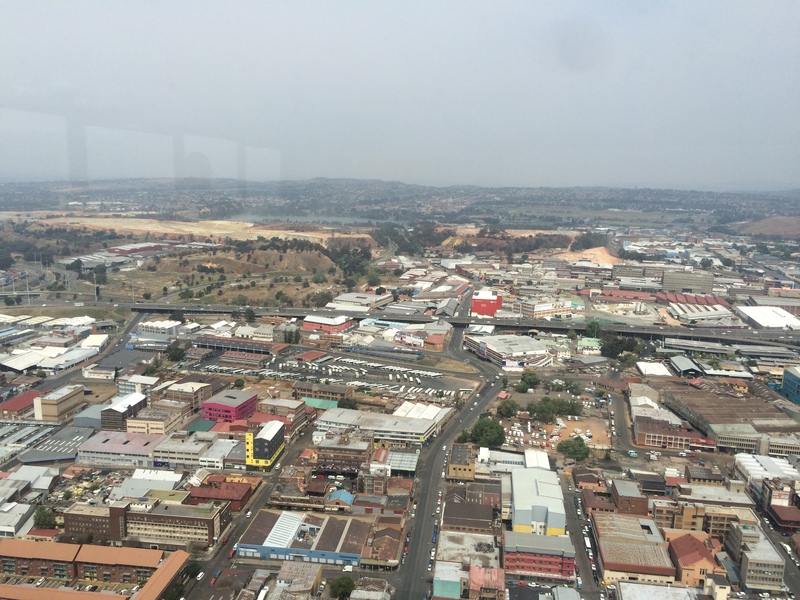 The 50th floor of the Carlton Centre – an attraction known as the Top of Africa viewpoint – in the heart of the CBD is a good place to get a sense of how Johannesburg fits together. Immediately at the foot of the tower there are grid-like streets where the original mining town was built. Then to the south in the distance you can see heaps of stone indicating entrances to the mine stokes. Gold mining by and large ceased in the Johannesburg area in the 1970s (you now need to drive at least two hours to find gold being mined today) as the authorities focused on building the city as a commercial, rather than industrial, centre. If you look carefully to the north, Constitutional Hill, which includes the old Boer fort, comes into view. When Johannesburg was founded in 1886 it was part of a state, the Zuid-Afrikaansche Rupubliek, which was independent of the British who threatened invasion. Given the presence of gold in the area, it wasn’t hard to see their motives. Boer leader Paul Kruger therefore built in 1893 the ramparts that today at the site, so he could keep watch on the city below. I’ll cover the area in more detail in a later blog because structures here gained notoriety in the 20th century for housing some very grim prisons. In 1900 during the Anglo-Boer war Johannesburg fell to the British. Following the victories over the Zulus two decades previously, these descendants of early Dutch settlers in the Cape living in two states were the only tribe left unconquered and a number of British colonialists were determined to achieve total control. One of these was Cecil Rhodes – the businessman and prime minister of the Cape – who hoped he could encourage the mining magnates (so-called ‘Randlords’) to start an uprising against the Boers in Johannesburg. Many of the city’s prominent businessmen were unhappy with Boer leader Paul Kruger because he had a monopoly on dynamite (essential for deep-level mining) in the region and he refused a customs union with neighbouring Cape and Natal, meaning they were forced to pay double duties when goods were shipped into ports like Durban. The city became “virtually English,” but they were among the 90% of the population that were refused permission to vote. Yet many of the elite in Johannesburg just wanted reform, rather than revolution, which frustrated Rhodes as he didn’t want to be seen as wanting to declare war on the wars. In the end however Rhodes’ partner in crime, Dr Jameson, the administrator of Matabelelad, got fed up waiting and simply sent in his force of policemen in the Transvaal, but the men at his disposal was woefully inadequate against Kurger’s eight thousand Boers. Jameson was sent for trial in England, charged with ‘launching a military expedition’ against a ‘friendly state’, while his men were locked up in Pretoria, leaving Matabelelad virtually undefended. The mistake cost Rhodes his post as prime minister in the Cape and his business interests were under threat. But Joseph Chamberlain, the British secretary of state for the colonies who was in on the act, largely managed to distance himself (although Kruger suspected he was involved). After the bungle, there was an attempt by the British to negotiate with Kruger and widened the voting franchise immediately, but he refused because he sensed it was an attempt to take over his country by diluting Boer control. The gold mining industry was booming in July 1899, with a record £8.7 million for the month recorded, so most owners didn’t want war. But by the September, two thirds of businesses and most mines in the area closed, as there was an exodus from the city. War finally came when the Boers delivered an ultimatum to remove their troops from the borders. They did not and so the fighting began. It was not however the easy war that Lord Kitchener had predicted, but the most expensive and devastating since Napoleonic times – 30,000 Boer homes were burned to the ground and some 26,370 Boer women and children died in concentration camps. In the years that followed Johannesburg. And as I’ll chart in my next blog in the series on South Africa, the city would see the very worst of racial segregation – many years before apartheid was officially introduced in 1948.